The current rotation means some of the top teams will meet only once during the season. (Francisco Kjolseth | The Salt Lake Tribune) Utah head coach Larry Krystkowiak argues a call against Northern Arizona in Men's Basketball at the Jon M Huntsman Center in Salt Lake City, Utah, on Friday, Dec. 21, 2018. 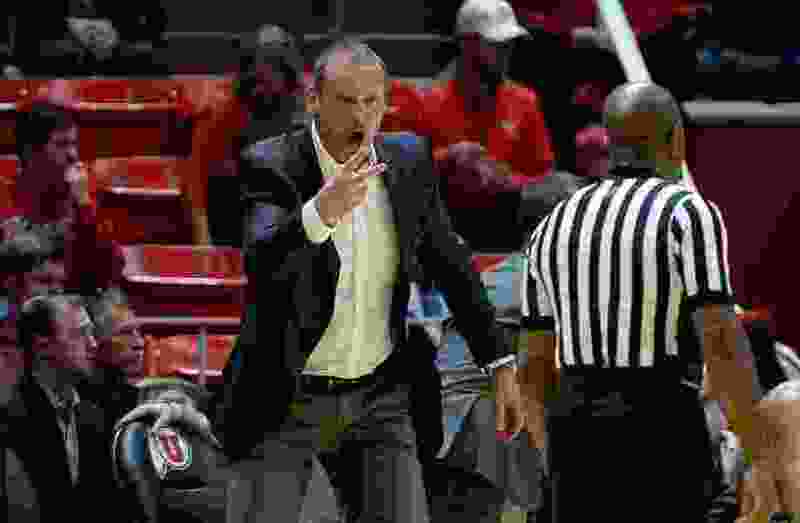 Utah coach Larry Krystkowiak advocates a Pac-12 basketball scheduling method other than the current rotation that assigns opponents far in advance. A change prior to the 2018-19 season might have helped the Utes finish more respectably, but that’s not Krystkowiak’s motivation. Besides, it is too late for them to add another round of games vs. California and Stanford, Utah’s opponent Thursday night at Maples Pavilion. Not having Cal and Stanford visit the Huntsman Center might make the difference between a winning and losing record for Utah (9-8, 3-2 Pac-12) this season. More to the point, Washington’s meeting Arizona and Arizona State only once each could affect those teams' NCAA Tournament seeding or determine whether or not they make the field at all. They’re currently inside the ESPN Bracketology projections, but barely so, in the cases of the Arizona schools. That's why Krystkowiak is among the Pac-12 coaches who want the conference's top teams to be assured of facing one another twice each year, for the sake of their strength of schedule as they build NCAA Tournament credentials. Citing the challenge of marketing nonconference games, Utah deputy athletic director Scott Kull wishes the Pac-12 would go to a 22-game league schedule, with every conference member visiting the Huntsman Center each season. That’s unlikely to happen, although it would solve the inequity issue. The 11-team Big Sky Conference has adopted that format, with a 20-game schedule. In the Pac-12, each team plays seven opponents in a home-and-home series; the other four are single-game matchups. Even a method of making sure the so-called best teams play one another twice is complicated, but Krystkowiak supports it. “I think we want what's best for our league … and the ultimate goal is to have as many of your teams participate in the NCAA Tournament,” he said. The process is tricky, in the interest of maintaining travel partnerships, as the coaches try to project the league's top teams. Conference-leading Washington, for example, may have been punished this season by its pairing with lowly Washington State, keeping the Huskies from playing Arizona and ASU twice each. Moving to a 20-game schedule would mean only two exceptions for each team in the home-and-home pairings. The main issues include some loss of flexibility in nonconference scheduling and working around the College Football Playoff in launching the Pac-12 basketball season in late December. Krystkowiak doesn't believe those are major obstacles, noting how the Big Ten works in some conference basketball teams in mid-December, prior to the football bowl games. And he says fewer nonconference games would make scheduling more focused and balanced. The Utes missed the NCAA Tournament last season, when a home win over Oregon may or may not have significantly helped their cause. In any case, the Ducks didn’t come to the Huntsman Center. In 2016-17, it may have helped Utah to visit USC and UCLA. This season, Utah won’t play at Oregon and Oregon State and won’t host Cal and Stanford. Beating those teams at home wouldn’t strengthen Utah’s credentials in 2018-19, when the Utes are far from any NCAA Tournament at-large consideration. Just for the sake of finishing above .500, though, it would have helped them to get two likely victories vs. those schools. All the Utes can do is beat them on the road. That would be an achievement. They’ve never won at Stanford in the Pac-12 era, and even their talented 2015-16 team lost in Berkeley. At Maples Pavilion, Palo Alto, Calif.
Records: Utah 9-8 (3-2 Pac-12); Stanford 9-9 (2-4 Pac-12). Series history: Utah leads, 20-13. Last meeting: Utah 75, Stanford 60 (2018). About the Utes: Utah is targeting its first three-game winning streak of the season, having defeated Washington State and Colorado at home. … Benchmarks: Utah is 8-1 when posting 15-plus assists, 8-2 when recording 35-plus rebounds and 6-2 when committing 12 or fewer turnovers. The Utes also have had at least three double-figures scorers in each of their nine wins. … Utah will play Saturday (6 p.m. MST) at California. The Bears will host Colorado on Thursday, seeking their first Pac-12 win. About the Cardinal: Stanford beat Washington State 78-66 on the road last weekend, even without top scorer KZ Okpala, who missed the game with back spasms. Okpala averages 17.9 points and scored 29 points in a 75-70 home loss to Arizona.… Ute coach Larry Krystkowiak likens Stanford’s length to Washington’s; Utah had trouble with the Huskies' shot-blocking ability. … Former Stanford coach Mike Montgomery, one of Krystkowiak’s mentors, will the Pac-12 Networks' game analyst.